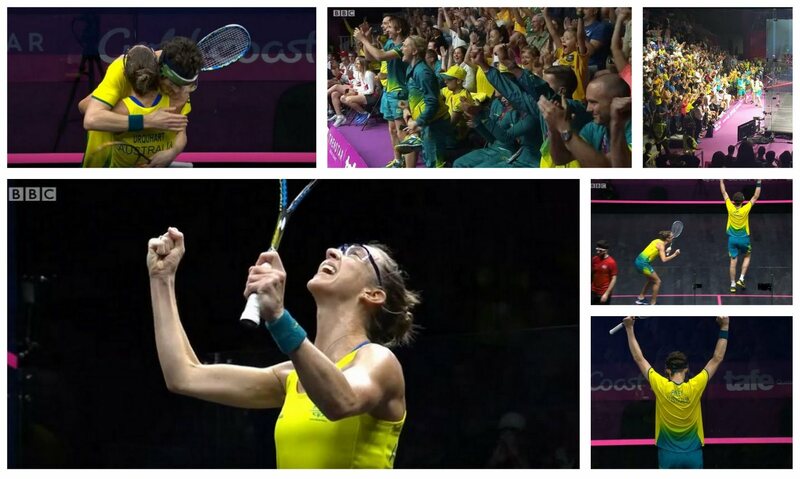 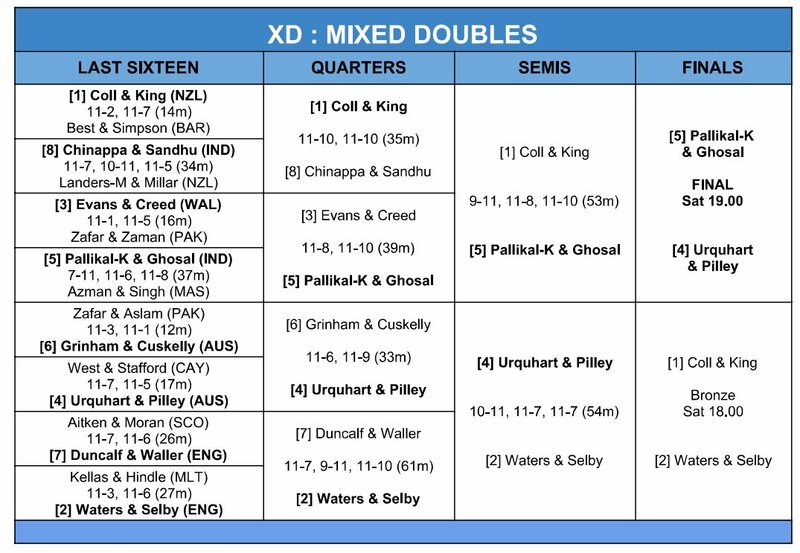 Both Mixed Doubles semi-finals were thrilling affairs and both produced upset results. 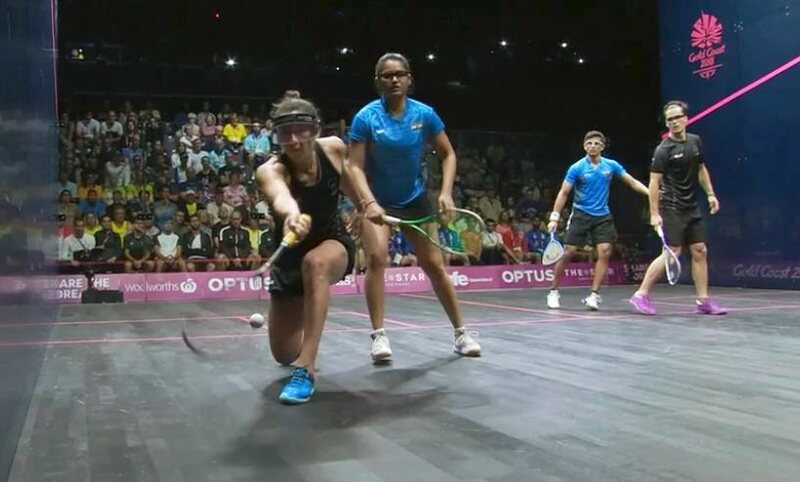 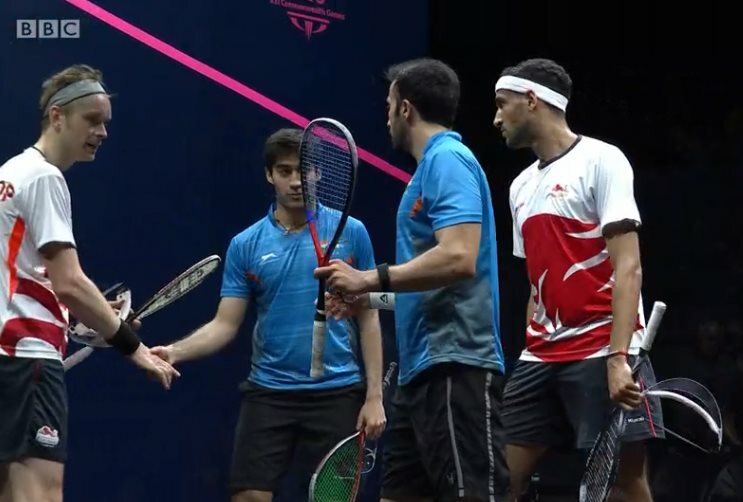 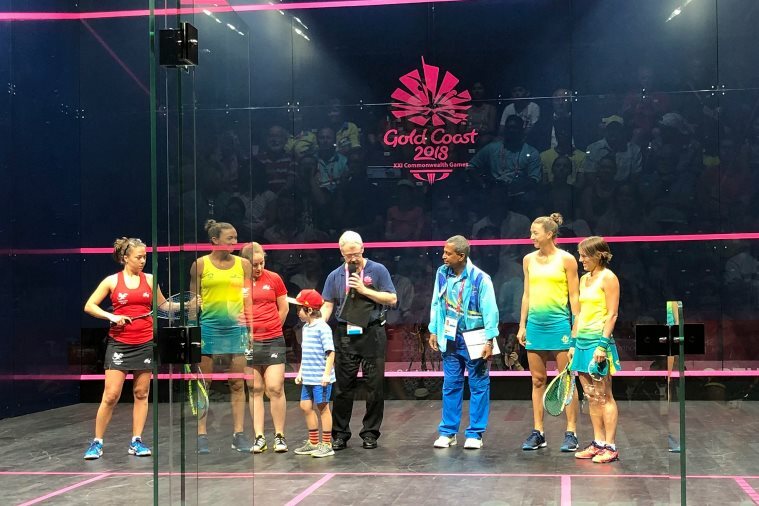 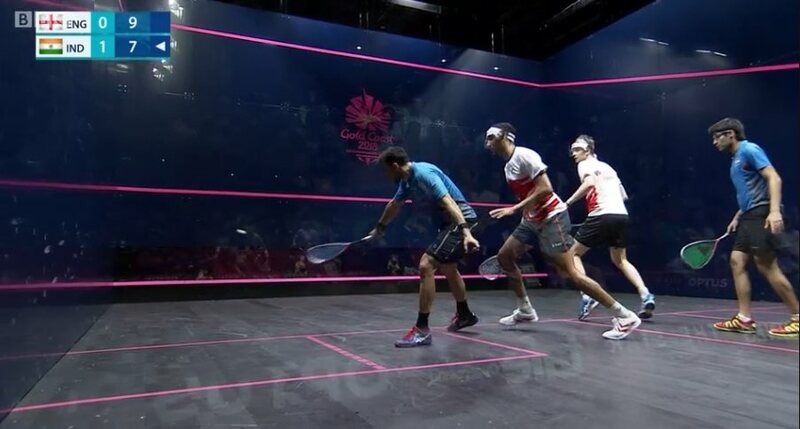 After dropping a close first game to top seeds King & Coll, India’s Dipika Pallikal Karthik &Saurav Ghosal fought back to level, then moved into the final as they carries a slender lead through the decider, clinching the win in sudden-death. 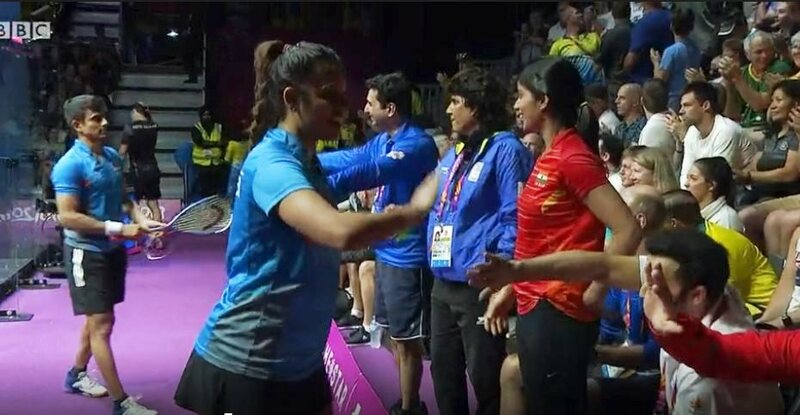 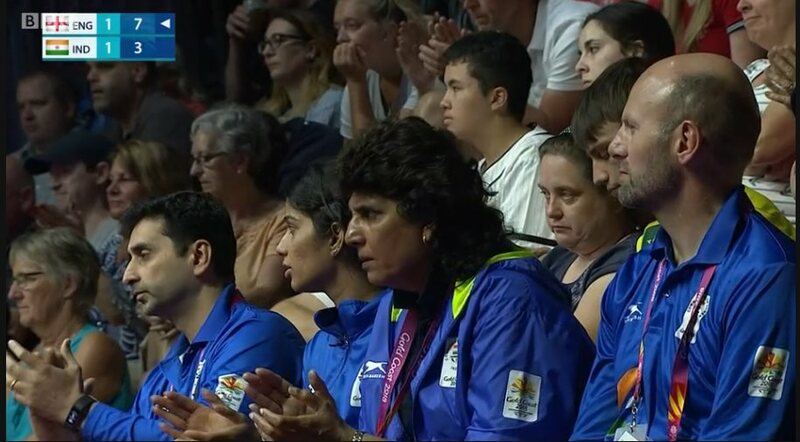 “Yes we did it,” said a delighted Indian National Coach Cyrus Poncha. 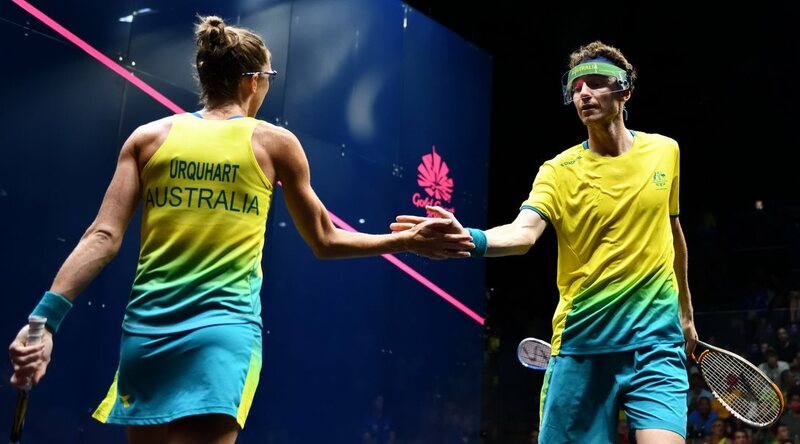 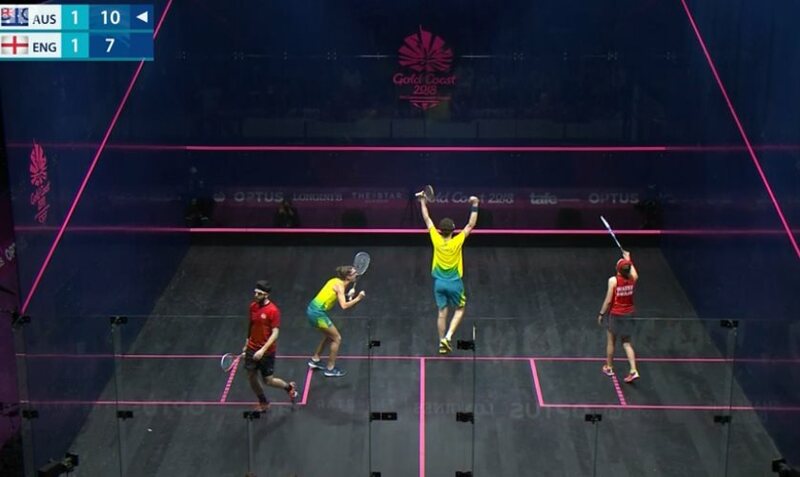 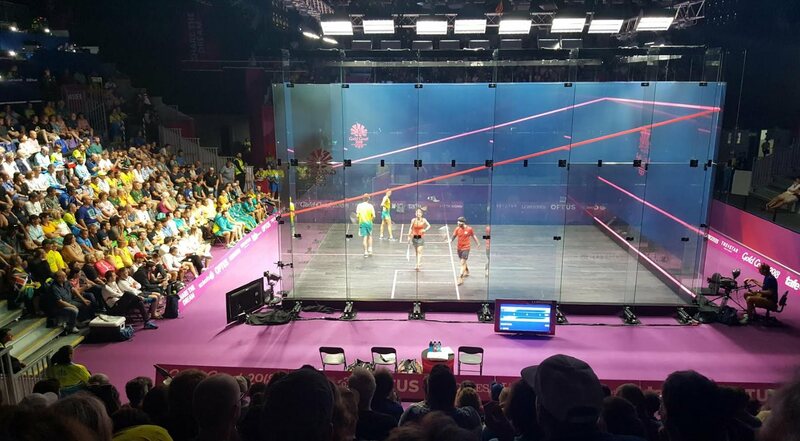 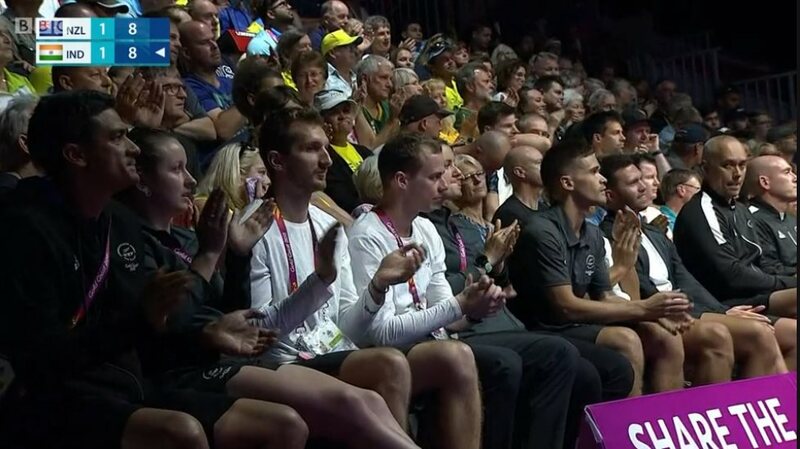 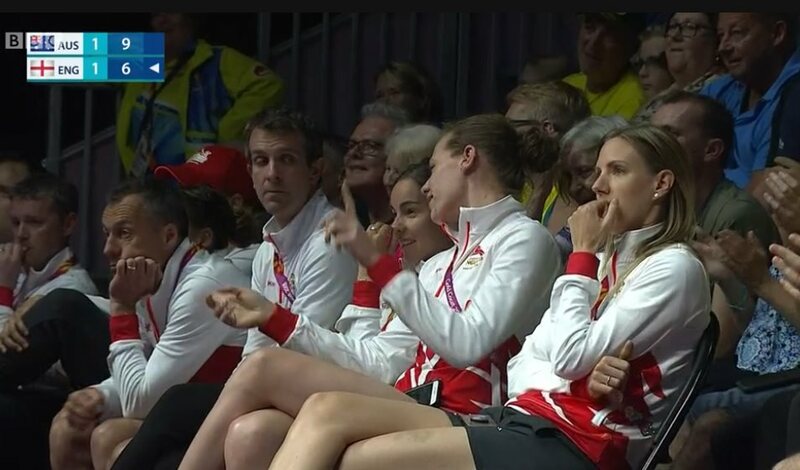 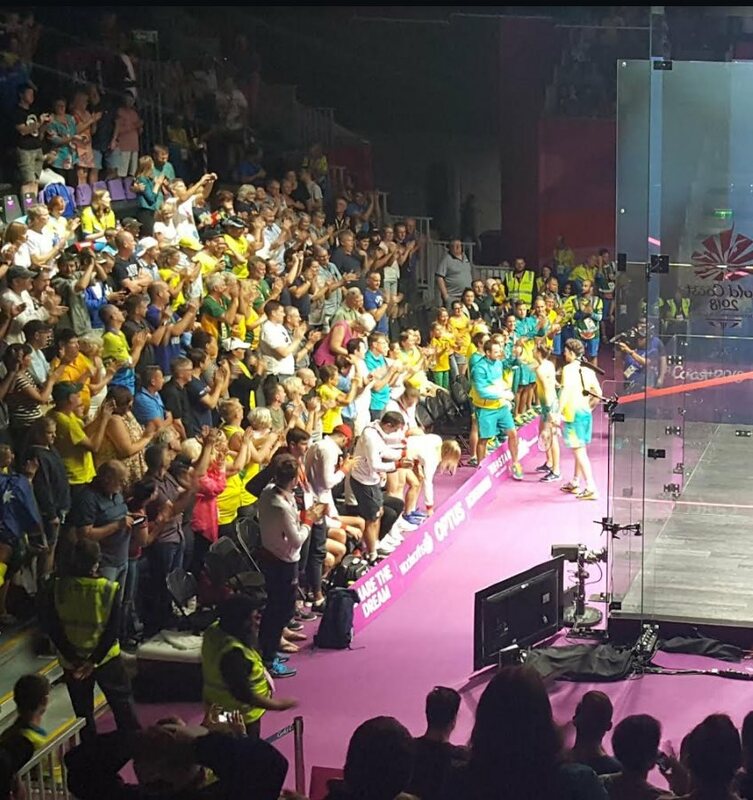 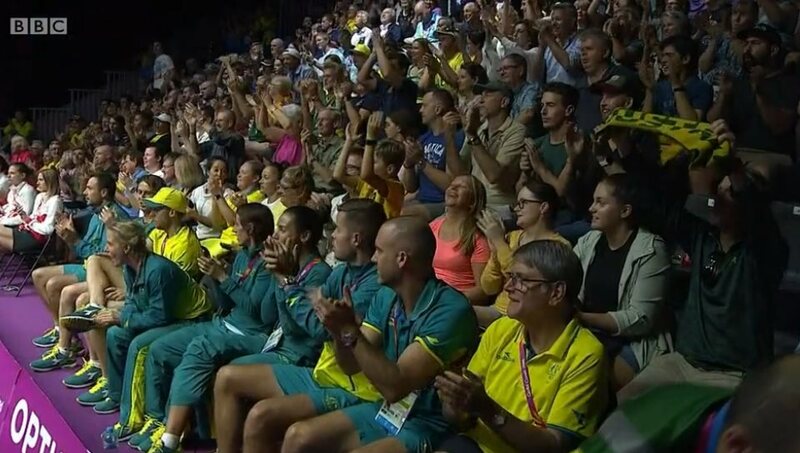 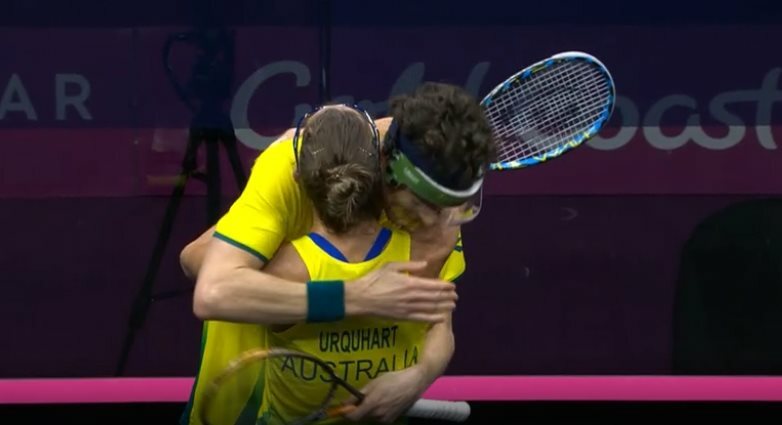 Australia’s Donna Urquhart & Cameron Pilley also lost the first game, to second seeded English pair Waters & Selby, but fought back to take the next two games to the delight of the packed crowd at Oxendale Studios. 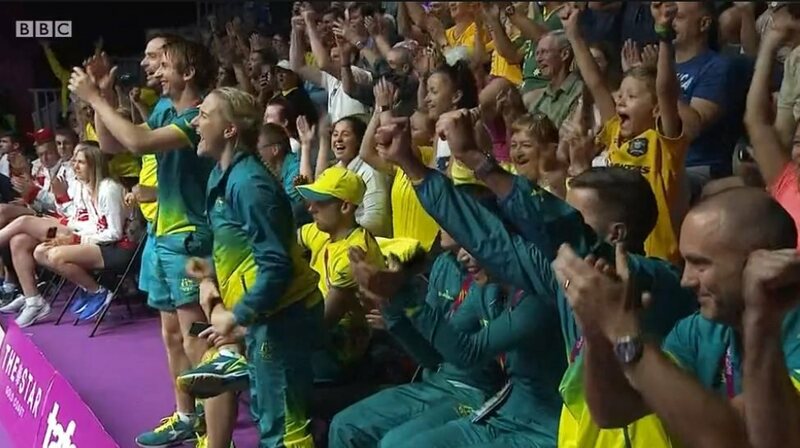 “We’re absolutely stoked,” said Pilley. 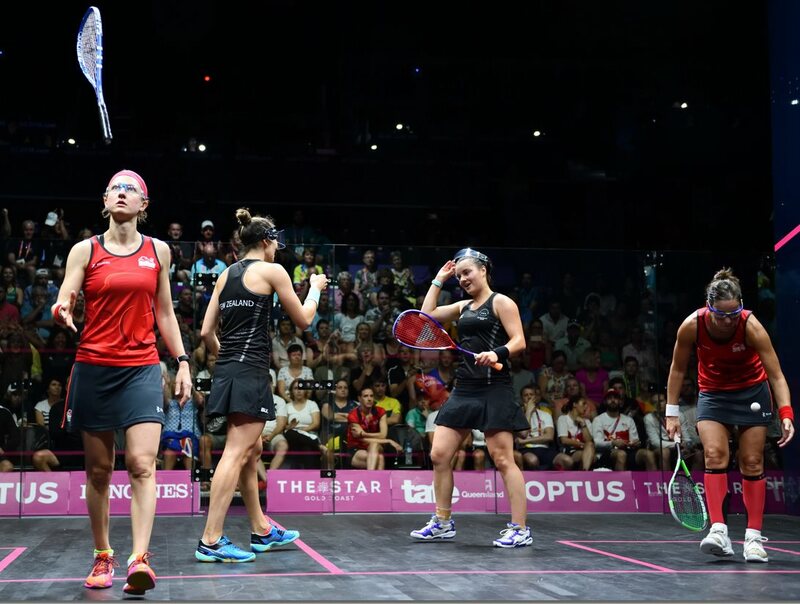 “We knew we were in for a battle. 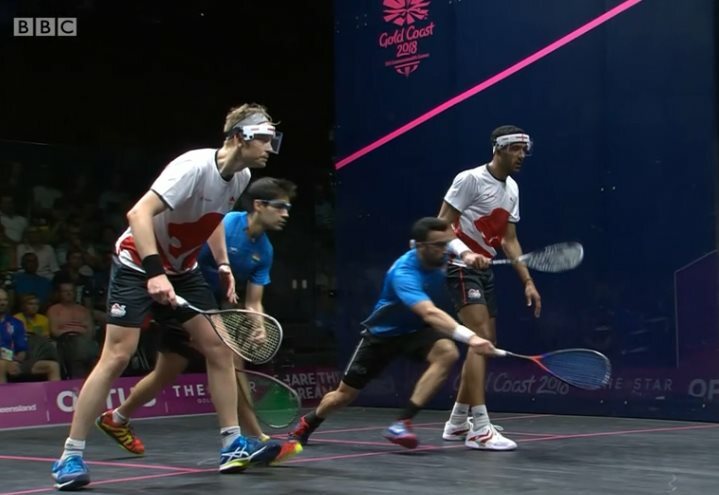 England were assured a finalist as they claimed victory in the first two Men’s quarters. 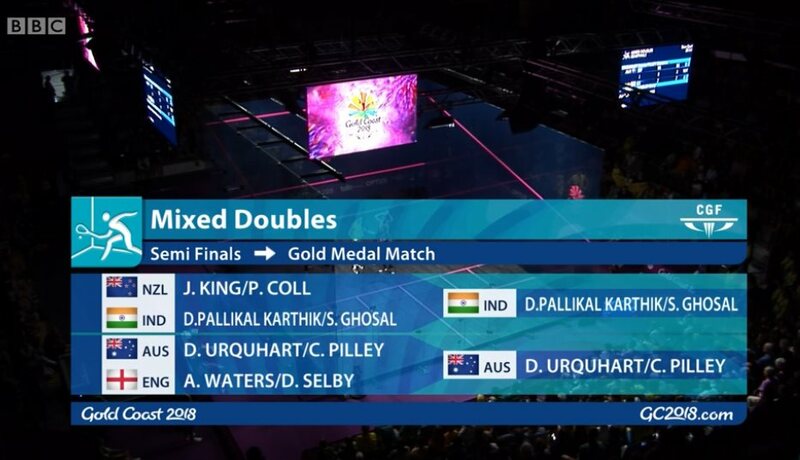 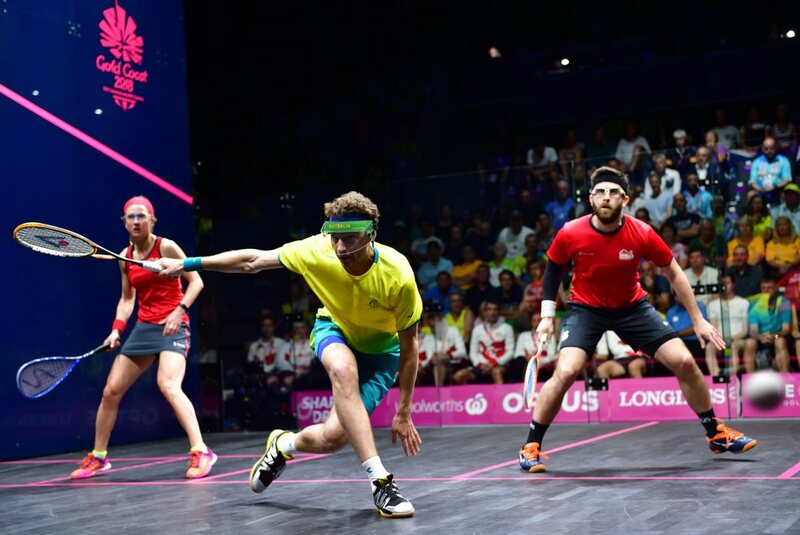 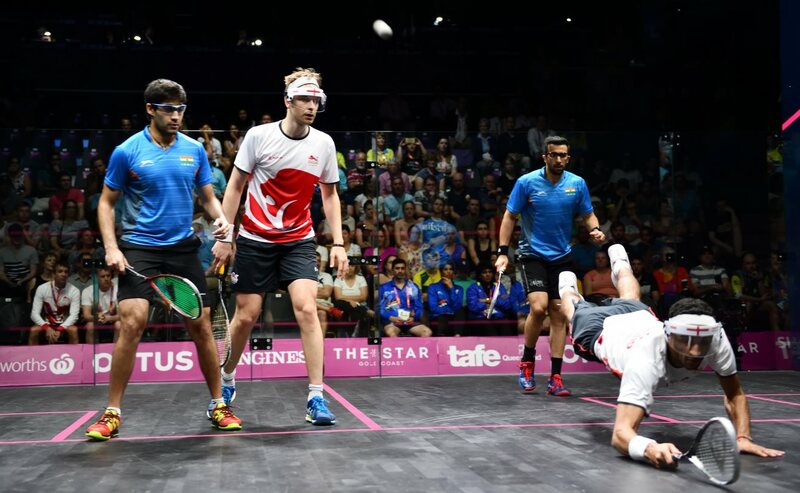 James Willstrop & Declan James came from a game down to beat India’s Malhotra & Tandon, while Daryl Selby & Adrian Waller produced a big upset on the side courts as they too came from a game down to beat top seeds and world champions Cuskelly & Pilley in third game sudden death. 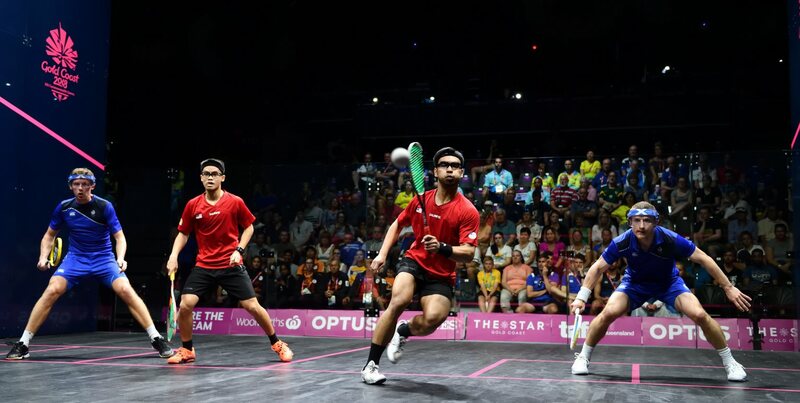 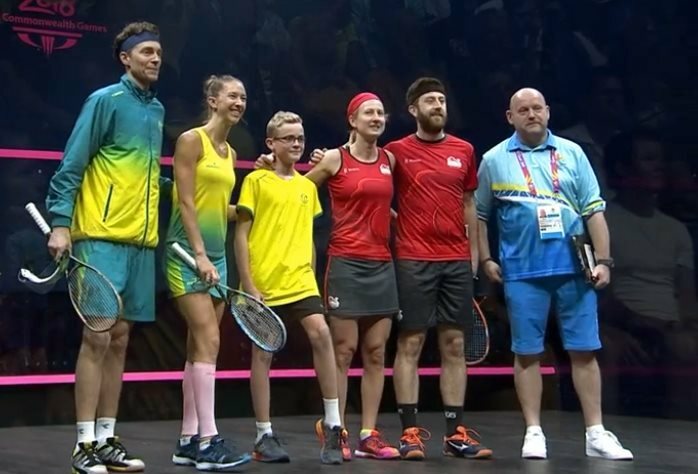 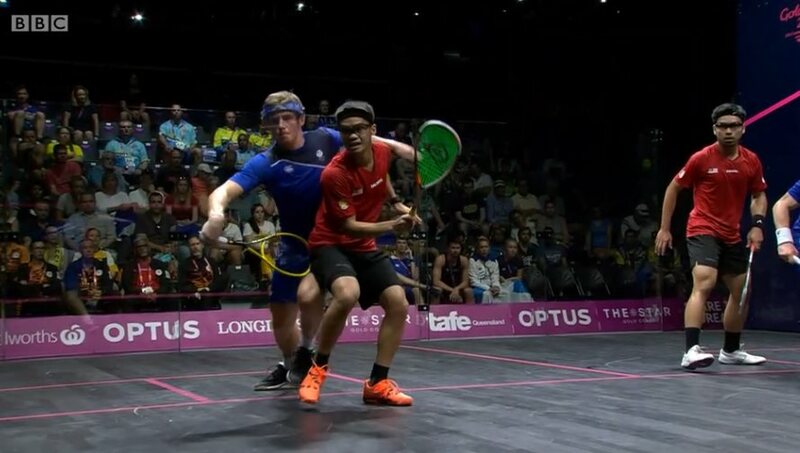 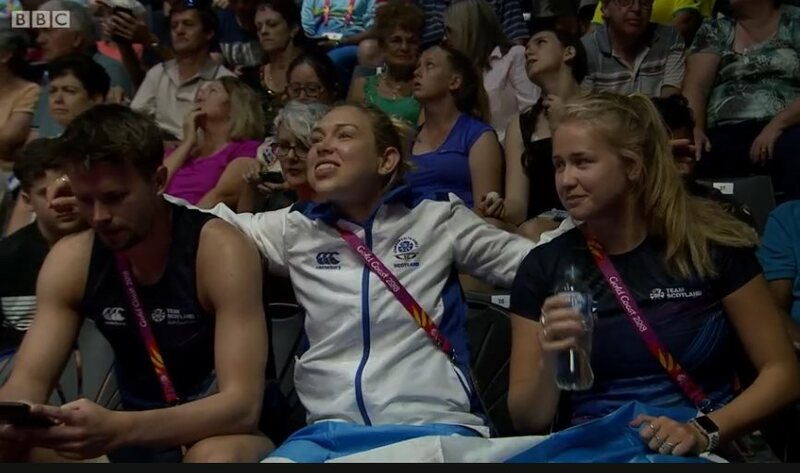 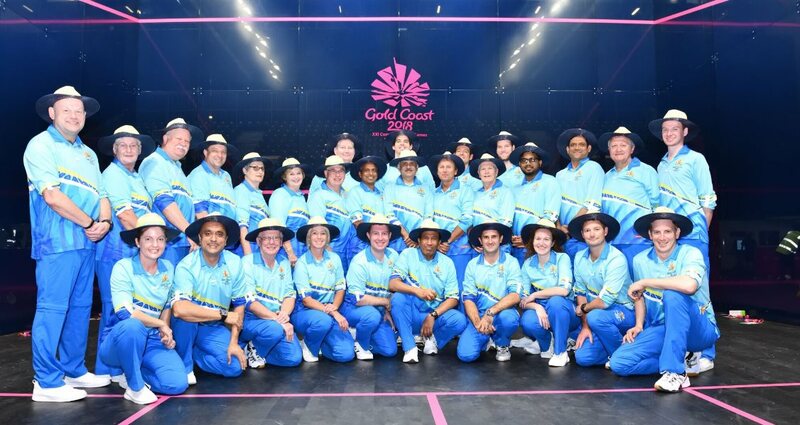 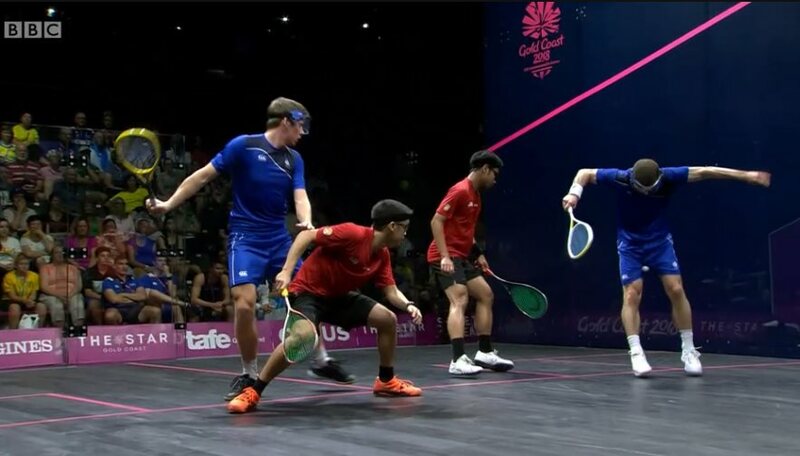 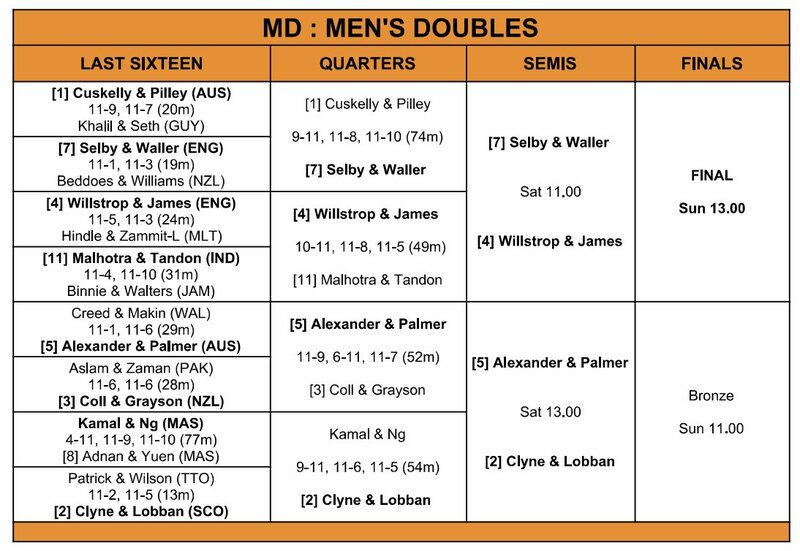 In the bottom half of the draw second seeded Scots Greg Lobban & Alan Clyne came from a game down to beat young Malaysian pair Ng & Kamal, while Zac Alexander & David Palmer kept Aussie hopes alive as they beat third seeded Kiwis Coll & Grayson in three games. 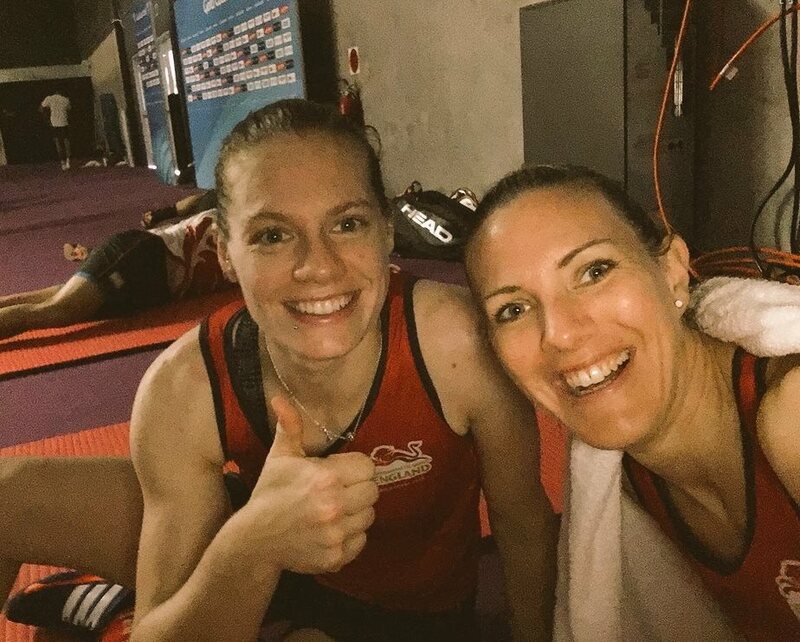 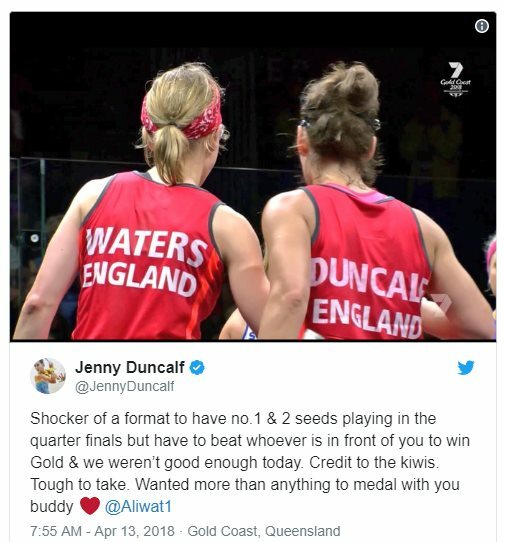 After losing their first Pool Match (albeit 10-11, 10-11) top seeds Joelle King & Amanda Landers-Murphy found themselves pitches into a quarter-final against second seeds Jenny Duncalf & Alison Waters, a repeat of last year’s World Doubles Final! 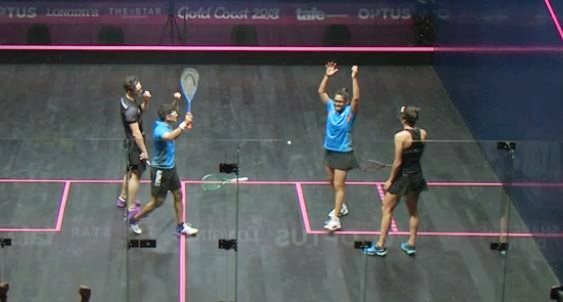 As in Manchester, it was the Kiwis who came through, taking the first in sudden death before easing through the second. 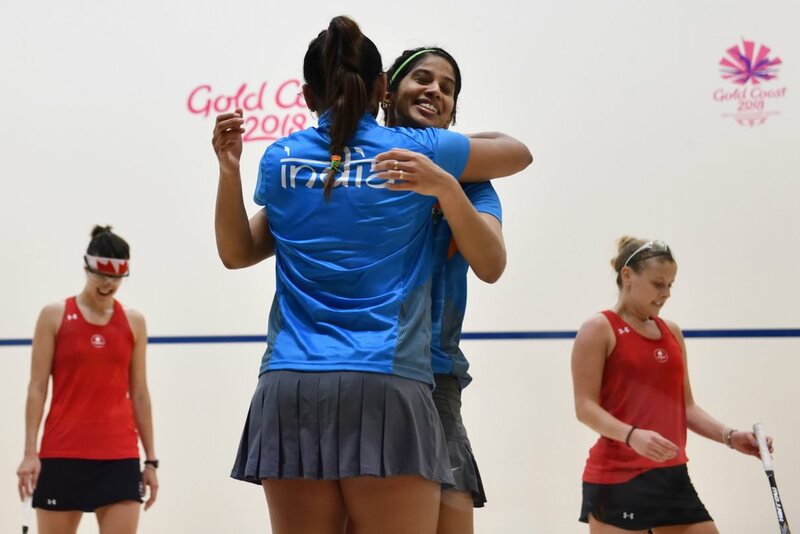 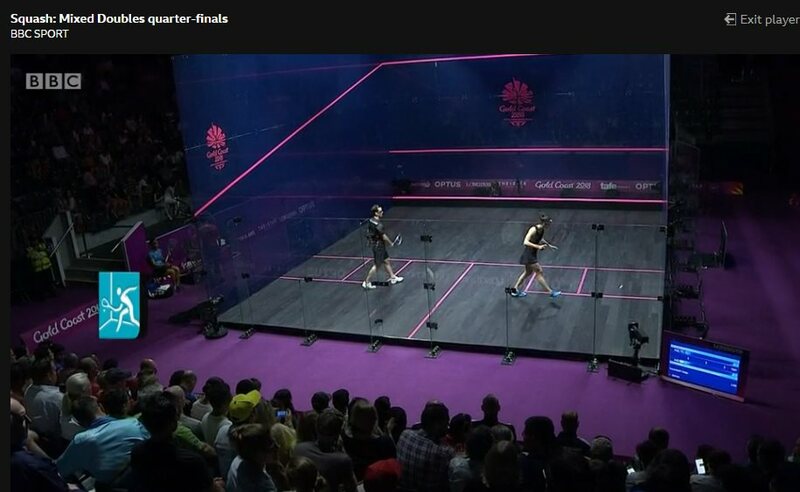 In the semis they’ll meet defending CG champions Joshna Chinappa & Dipika Pallikal Karthik, the Indian pairing who came from a game down to beat Canadian duo Sam Cornett & Nikki Todd. 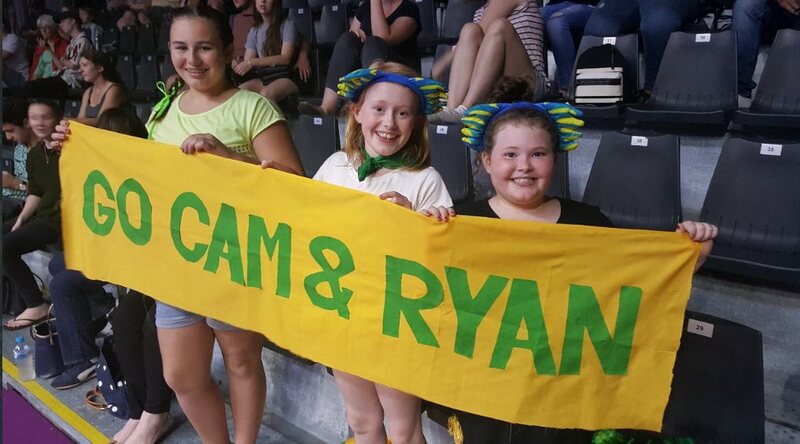 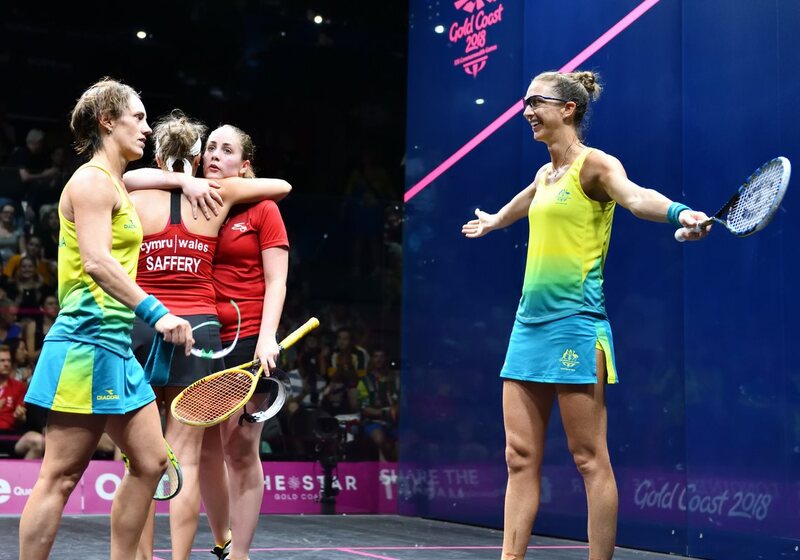 Home interest was maintained as Aussie pairing Rachael Grinham and Donna Urquhart staged a remarkable comeback to deny Wales’ Tesni Evans & Deon Saffery. 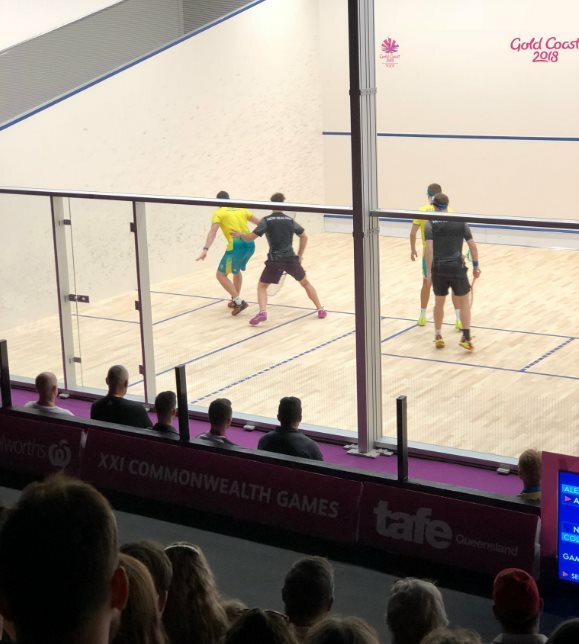 After taking the first game the Welsh went 9-1 up in the second but the Aussies fought back to lead 10-9, saved match ball as they won the sudden death point and went on to take the third comfortably. 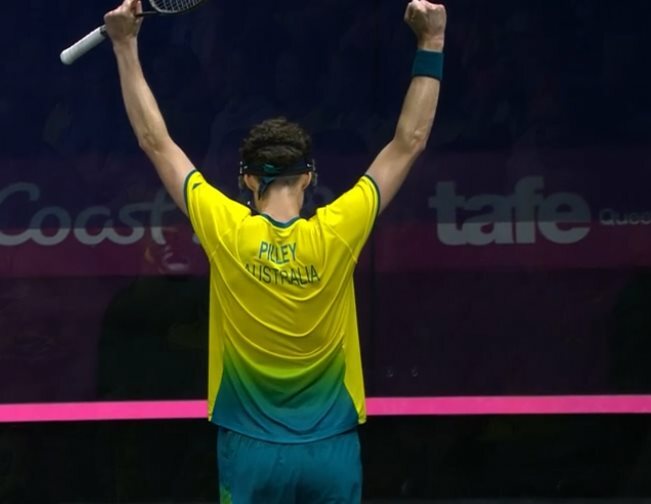 “I haven’t ever experienced a comeback like that,” said Grinhan. 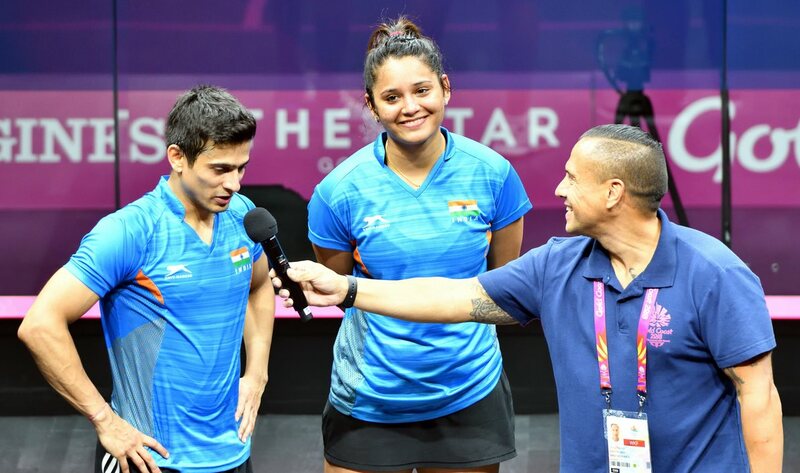 “Not that I can remember – but that’s a big one and we’ll always remember that! 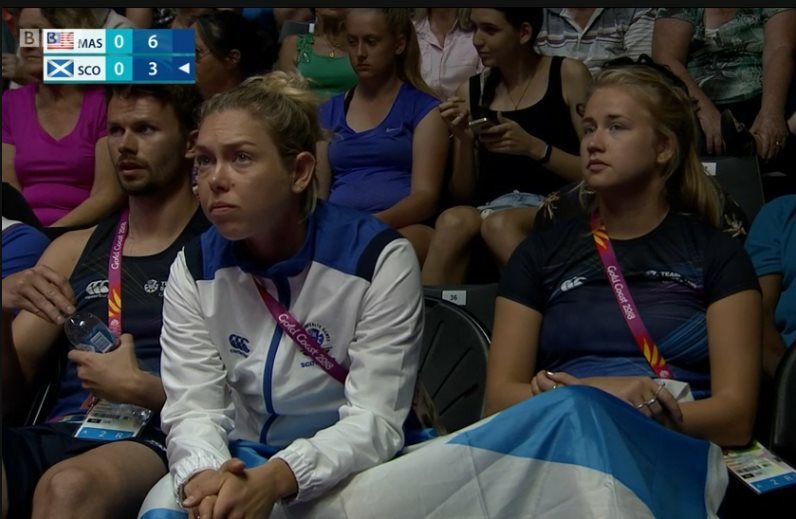 At 9-1 down the crowd were really quiet and with every point we got back they got louder and louder! 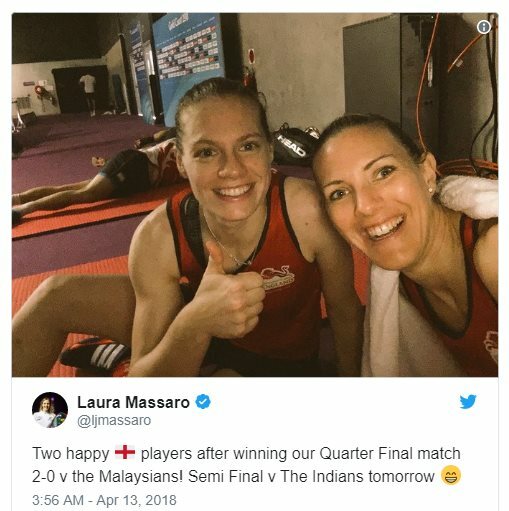 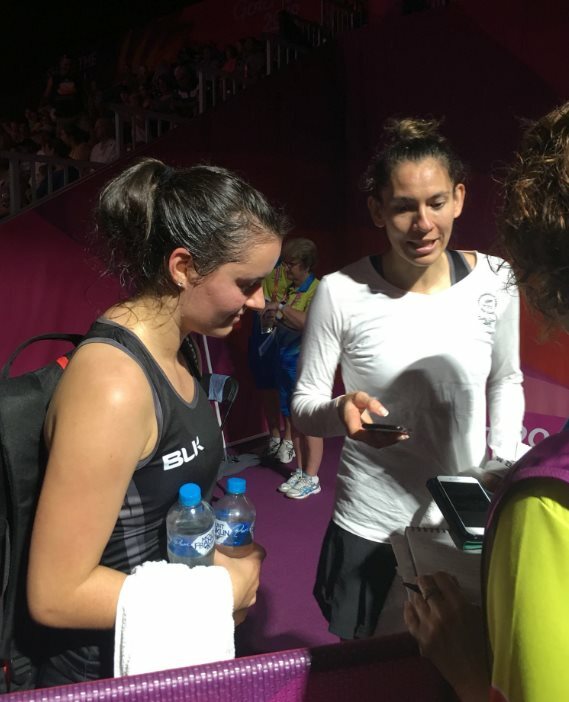 Having lost to compatriots Duncalf and Waters in the Pool stages, Laura Massaro & Sarah-Jane Perry would have expected to face the top seeds in the quarters, but that close win by Malaysian youngsters Rachel Arnold & Sivasangari Subramaniam threw the draw up in the air, and the English pair took full advantage as they won in two games.